Each year, Juilliard gives Community Engagement Grants (formerly known as Summer Grants) to help qualified students engage in service projects. Violinists Leerone Hakami and Lauren Siess performed classical, pop, Arabic, and Israeli tunes at the Arab-Jewish community center in Jaffa. We both feel a strong connection to Israel: Lauren has visited a few times and fell in love with the culture; Leerone calls it home. 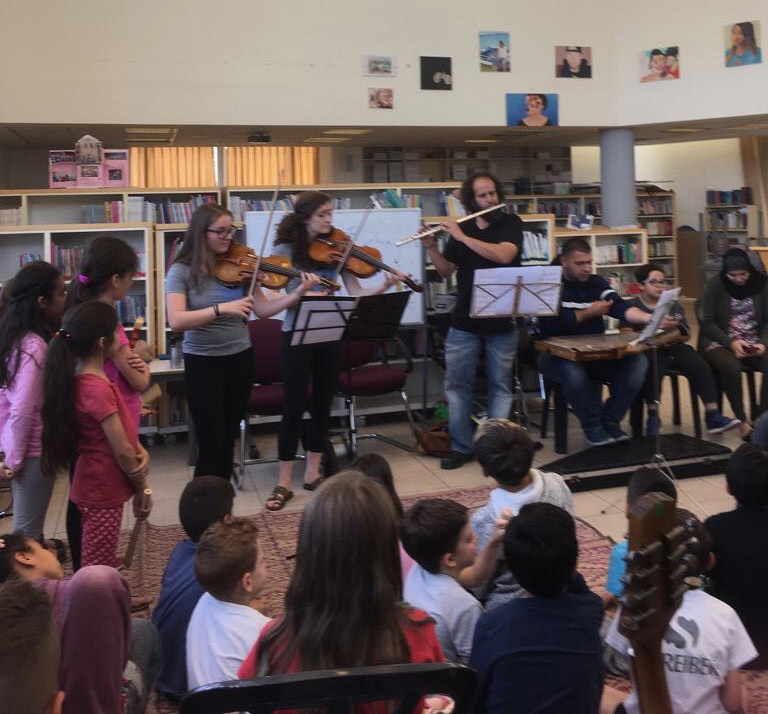 This spring, we had the pleasure of experiencing a variety of Middle Eastern cultural and musical practices for the first time when we used our Juilliard Community Engagement Grant for The Joining Hands Project, which aimed to promote peace and connect people through music. Our project began at the Max Rayne Hand in Hand school in Jerusalem, a K-12 institution that emphasizes unity through education among children of all religions and cultural backgrounds. Israel, along with many other nations in the Middle East, cannot remember a day without war, incredible hatred, and prejudice. The school is one of several that are part of the Hand in Hand Center for Jewish-Arab Education in Israel, which was founded in 1998. Despite the center’s often unbearable history as victim to hate crimes from those wishing to hinder peace, we were impressed by its perseverance and dedication to celebrating all cultural identities. Each class had one Israeli and one Arabic teacher, and the students spoke Hebrew and Arabic fluently with incredible proficiency in English as well. We first worked with a small high-school band that performs American, Israeli, and Arabic popular tunes for school celebrations. We played Western classical pieces for them and they reciprocated with an Israeli pop song, and then we found common ground through improvisation. Our second group consisted of 30 third graders who played a Russian tune for us on oud, mandolin, and recorder. We also improvised with them and then had them string together a story that we re-created on our instruments. We also played a beautiful Arabic tune with two of their teachers—an Israeli flute player and an Arab kanun player (another instrument that was foreign to us) and found that the school staff members were moved that an Israeli and an American took the time to learn how to play an Arabic tune in an Arabic style. Our final group was fifth graders who played Israeli and Arabic music as well as Vivaldi’s “Spring” on mandolin and oud. We spent the next few days with K-12 vocal and instrumental students—many of whom wish to pursue music—who attend afterschool programs at the Arab-Jewish Community Center in Jaffa, a very mixed (Jewish-Arab) region. 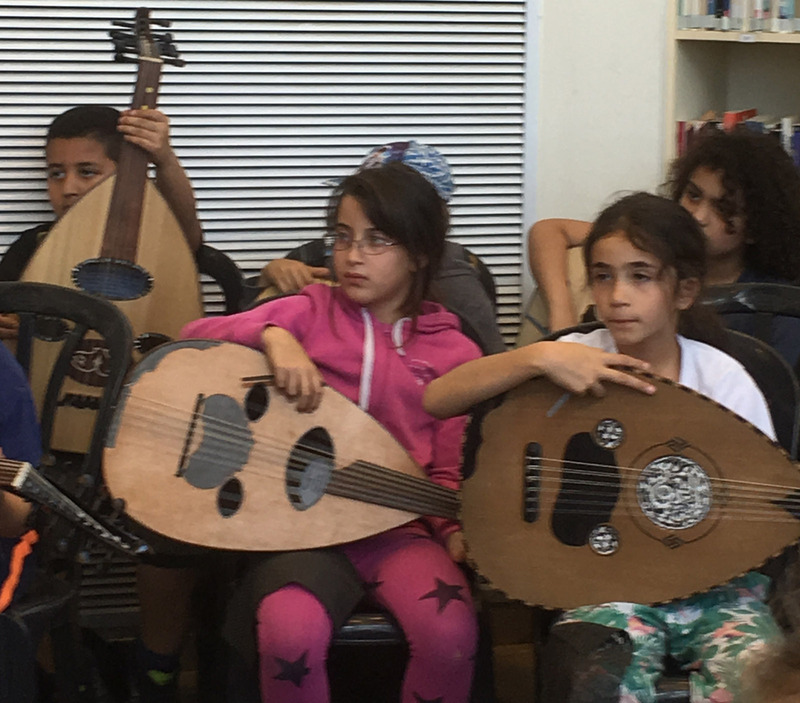 On our first day, we performed classical, pop, Arabic, Israeli tunes, and an improvisation for them, and the students—who played oud, piano, electric keyboard, guitar, violin, and recorder as well as sang—were excited to hear music they recognized and some new pieces. They were also eager to ask questions about careers in music, performance anxiety, and improvisation. Our hearts were torn as some students asked difficult questions such as “Would I still be allowed to study music in the U.S. as an Arabic Muslim given the current political climate?” Music is such a peaceful and diverse art that belongs to everyone; using cultural identity to compromise the safety and comfort of students who just want to follow their dreams and share their art is a great loss for all. The students played oud, piano, electric keyboard, guitar, violin, recorder, and sang. While we were in Jaffa, we led master classes on improving practice habits and allaying performance anxiety. And we also prepared for our culminating concert, which featured varying ages and levels with repertoire that ranged from Adele and Beethoven (we taught them “Ode to Joy”) to Arabic dance tunes. A few students had volunteered to improvise with us, and we also accompanied the chorus, which sang in Arabic, Hebrew, and English. The Joining Hands project was an eye-opening cultural and musical experience. At Juilliard and throughout our lives, we’re consumed with Western classical music, so we were intrigued that blending classical and Middle Eastern music created a common ground between people of different backgrounds. An Arabic Muslim mother we met praised the tolerance and inclusion promoted at the Hand in Hand school and told us that she’d seen a significant change in her daughter’s attitude toward students of different backgrounds since enrolling there. The first steps to peace begin with this type of education, and we feel so lucky to have experienced this building block to a more unified world. Violinist Leerone Hakami and violist Lauren Siess had completed their second years at Juilliard when they wrote this article.